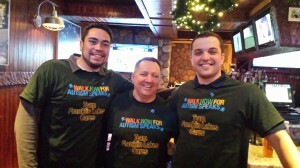 On February 25th, Axis Insurance Services co-hosted a fundraising event to support the Northern New Jersey Walk Now for Autism. This event was held to kick-off the company's efforts to gather donations and sign up new members to walk with Team Franklin Lakes Cares. The team is seeking to raise at least $10,000 towards the cause. Overall, about 120 people showed up to the event at Valley Stables Food & Drink in Oakland, NJ. As a result, the team was able to raise about $2,000 for Autism Speaks including a $1,000 contribution by Valley Stables. There was live music and about 20 people signed up to join the team for the walk in May and help raise money and awareness of the cause. This brings the team's total funds raised to over $6,000 towards the goal of $10,000. Axis is still seeking to recruit additional members and donations for the walk on Sunday, May 18th at MetLife Stadium. Please visit the team page for more information.